I promise that this is the last grapefruit recipe! So if you did decide to make the curd you probably have plenty left over and need something to do with it. I found this recipe in the current issue of Delicious but it was made with lemon curd. To be honest overall I wasn’t thrilled with the result, but with a few changes I think it could be fantastic. Firstly, make sure the base is very thin and is cooked through. I found that the slightly undercooked base was too dense and doughy and detracted from the curd. 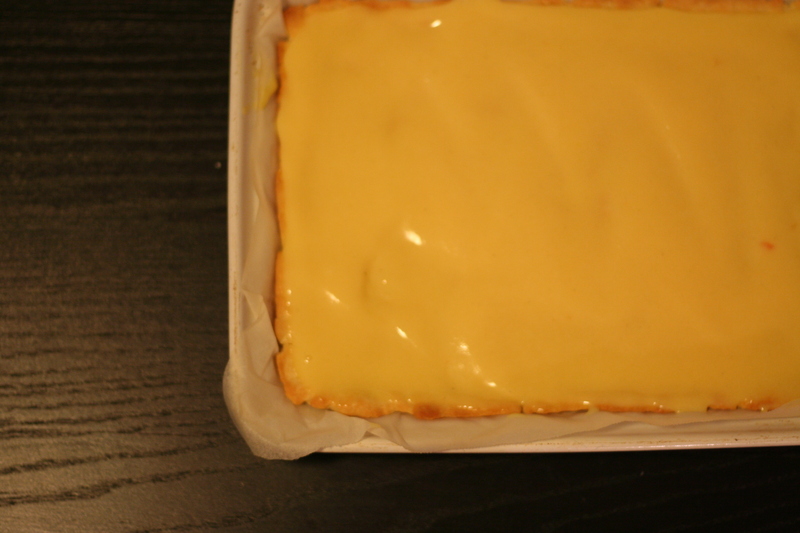 The curd should be a thick layer, don’t be afraid to add too much. I also think a really tangy curd would work better than a sweeter one. 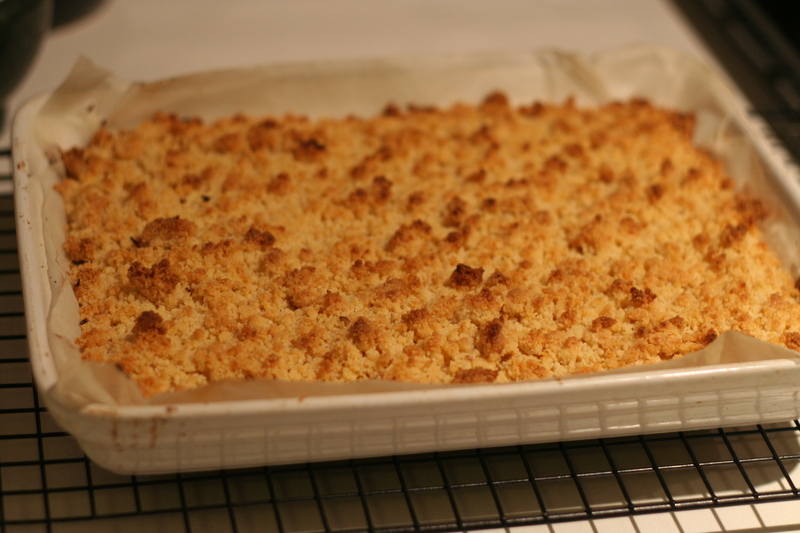 Lastly, to make the flavour a bit more complex, add some spice to the crumble layer. Cinnamon, nutmeg or ginger would all work well. The recipe does make a large slice, enough to feed 8 people easily and it is quick and simple to put together so it’s perfect for impromptu dinners with the in-laws as I recently discovered. Don’t be put off by my disappointment in it, I really do feel it would work well with the above changes. If you try it out make sure to let me know how it goes. Sift the flour and icing sugar into a mixing bowl and add the butter. 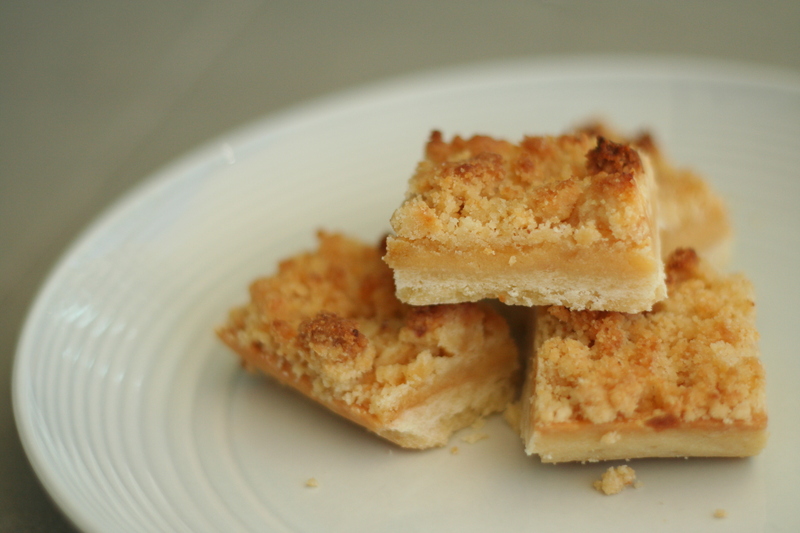 Either use a food processor and pulse the mixture or crumble the butter in your fingers until you get a fine crumb consistency. Add the yolk and milk and blend until the mixture comes together into a dough. Knead the dough briefly until it’s smooth then cover and refrigerate for 30 minutes. For the crumble place all the ingredients except for the egg yolk in a bowl and rub between your fingers until you get a coarse crumb. Stir the yolk through and chill until required. 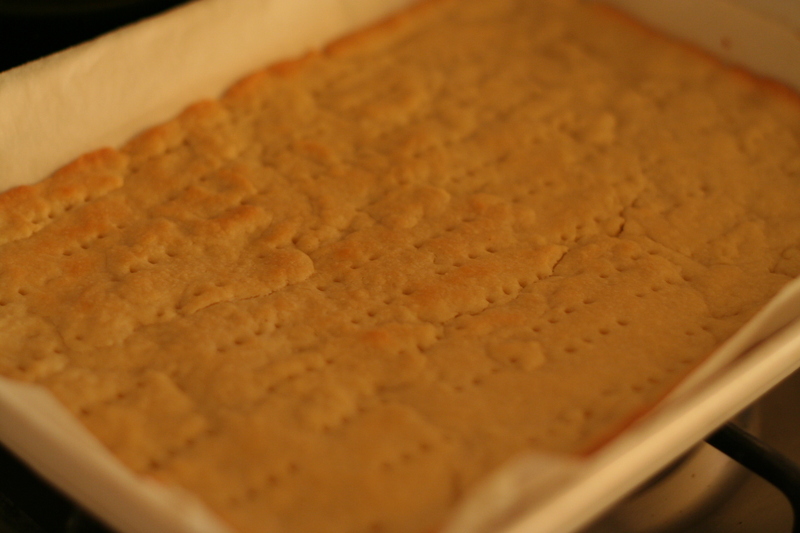 Preheat the oven to 180° and prepare a 28x18cm tin with baking paper. Crumble the pastry into the tin and press firmly. I recommend keeping it quite thin. Prick all over with a fork and place back in the fridge for 15 minutes. When chilled bake for 30-35 minutes, or until golden and dry. Allow to cool to room temperature. 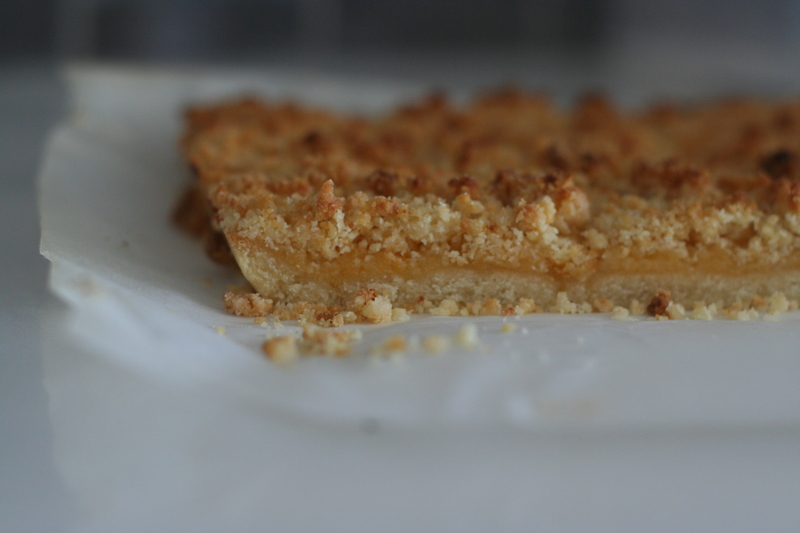 Spread the grapefruit curd over the base then scatter the crumble over the top. Bake for a further 20-25 minutes or until golden. Allow to cool completely in the pan then remove and slice.